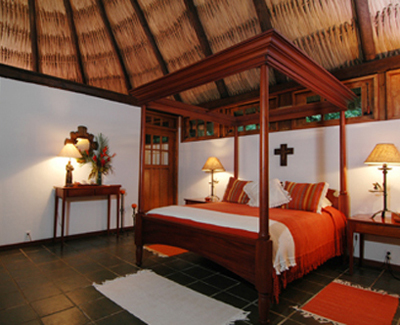 Set on the tranquil banks of the Macal River, The Lodge at Chaa Creek: Adventure Centre, Rainforest Reserve and Spa . . .
Set on the tranquil banks of the Macal River, The Lodge at Chaa Creek: Adventure Centre, Rainforest Reserve and Spa offers a unique blend of tropical seclusion and inland adventure. Nineteen palm-thatched adobe cottages and two luxury suites feature tile floors and mahogany beds; all now have electricity. Beyond the lodgings, large expanses of rainforest and sub-tropical woodland are explorable by canoe, horseback, or forest trails. Inland expeditions also include treks through the Mayan ruins, tours of a unique butterfly farm, and tropical camping at the remote Macal River Camp Site. The main lodge, which has electricity, houses a festive bar and elegant thatched-roof restaurant where guests enjoy a mixture of American, Mexican and Belizean cuisine.